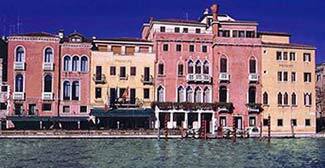 ABOVE: The Hotel Principe from the Grand Canal. INSET BELOW: The hotel's restaurant terrace. Category: Four-star hotel. Closest Alilaguna Airport Boat stop: Guglie. Location: On the Rio Terà Lista di Spagna, near Venice's main railroad station. You're arriving or departing by train, and you're looking for a high-quality hotel near the station that you can reach on foot without crossing any bridges. As you leave Santa Lucia Railroad Station (by the side door, if you want to avoid the steps), turn left. Follow the crowd past the Scalzi Church and into the main pedestrian street, the Lista di Spagna. Soon, you'll see the Hotel Principe on your right. The entrance is on the street, but the hotel's façade and restaurant terrace overlook the Grand Canal. Note: The Principe is an especially good choice if you're arriving by train and leaving for Marco Polo Airport by water taxi (or vice versa), because it has a private boat landing on the Grand Canal. In the top photo, the Santa Lucia Railroad Station is on the left, the Scalzi Church is next to it, and the Rio Terà Lista di Spagna is just past the Ponte dei Scalzi bridge. The Hotel Principe faces the Grand Canal near the right side of the picture, just before the open area along the waterfront. In the second photo, you can see the front building of the Hotel Principe (where the entrance is located) near the lower left corner of the frame.